Photoelectrocatalytic CO2 reduction to CO was achieved on Cu2O/Cu2S nanoparticles which are immobilized in TiO2 nanocavity array. The Cu2S shell was obtained by ions exchange reaction of O2− and S2− on the surface of Cu2O by a chemical vapor deposition with Na2S precursor. This coating can protect the Cu2O nanoparticle from photocorrosion during photocatalysis. The lower resistance and plasmonic absorbance endow a superior activity of the Cu2O/Cu2S heterostructures toward photoelectrochemical reduction of CO2. It exhibits a current density of 10.7 mA cm−2 at the overpotential of − 0.26 V with a CO faradaic efficiency (FE) higher than 81%. 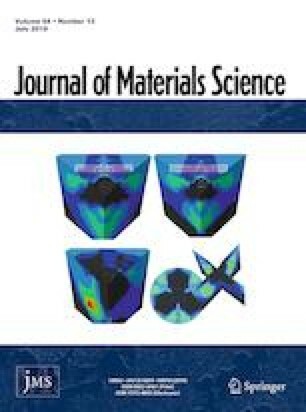 The excellent photo-assisted catalytic performance (photo-induced current increment is more than 50%) is attributed to the localized surface plasmonic resonance of Cu2S coatings and highly ordered hierarchical structure of the Cu2O/Cu2S nanoparticles, which facilitate charge carrier separation and mass transfer. These hybrid electrodes demonstrate a long-term stability by resisting photocorrosion within 5 h with a higher FE of CO2 to CO conversion. The online version of this article ( https://doi.org/10.1007/s10853-019-03615-4) contains supplementary material, which is available to authorized users. This work was financially supported by the National Natural Science Foundation of China (Grant Nos. 61774020, 51672148, 51272123, 51802021).